Who needs ice cream when you can have Triple Mint Chocolate Cake? Some people class ice cream as a comfort food and while I like it I think it's too cold to qualify as something truly comforting. Cake however is a different matter, especially when served with a cup of tea. Although there has been some bouts of sunshine recently it still hasn't been ice cream melting weather so if you want the flavour of a mint choc-chip ice cream but the comfort of a cake then this bake is for you. This cake came about through a meeting of the Clandestine Cake Club. The theme of the month was 'Spring Fresh Tastes' and my daughter always likes to make some sort of chocolate cake. For a fresh taste that went with chocolate I interpreted this to be mint and decided to triple it so you couldn't miss it. For the boiled mint sweets I used Sainsbury's Basics clear mints but anything like Fox's Glacier Mints will do. The chocolate I used for the topping was again Sainsbury's Basics. It has the same cocoa solids content as Cadbury's Bourneville but at a fraction of the price. I also got the peppermint extract from Sainsbury's. It's from their Taste the Difference range but fear not thrifters, it was reduced. For the gel colouring I used Dr. Oekter's 'Lime Green' colour. This month's We Should Cocoa challenge is being hosted by Victoria at A Kick At The Pantry Door and she has chosen 'Mint' as the theme. This challenge is run by Choclette at Chocolate Log Blog and Chele at Chocolate Teapot. With three layers to this cake I'm submitting it for this month's Tea Time Treats jointly run by Karen at Lavender and Lovage and this month's host Kate at What Kate Baked. Equipment: 9in (23cm) square baking tin, electric whisk, large mixing bowls, glass bowl to fit over a small saucepan. 1. In a jug measure 12fl oz (350ml) of boiling water and then dissolve the cocoa powder in it. Set aside to cool. 2. Pre-heat the oven to 180°C/Gas mark 4. Prepare the tin by greasing/lining it. 3. Pour the cocoa in a large bowl and then sift in the flour, bicarbonate of soda and baking powder. 4. Into the bowl add the butter/baking spread, sugar and eggs. Using an electric whisk beat until all well combined. 5. Stir in the mints then pour into the tin. 6. Bake for about 1 hour until cooked through completely. Leave in the tin to cool. 7. For the frosting get a large bowl and add all the ingredients. 8. Mix until well combined and the gel colouring isn't streaky. 9. Spread over the cooled cake base. 10. To make the topping use put the chocolate and butter in a glass bowl over a pan of simmering water. 11. Stir until it is fully melted and smooth. 12. Stir in the peppermint extract. 13. Spread over the frosting. 14. Refrigerate until set – this will be a minimum of 1 hour. I got a bit excited by the peppermint extract and wanted to use it! I can confirm it is! Thank you so much for entering this delicious, flavorsome cake into TTT- what a great CCC theme! Clandestine Cake Club meetings are a rich source of inspiration for cake bloggers! This recipe certainly seems to have been popular. Ooh, I like the layered effect of this cake and the added mints sound quite intriguing. 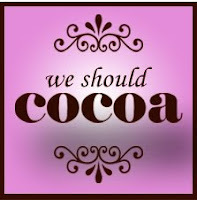 Thanks for joining in with We Should Cocoa. The mints really do give a good flavour to the chocolate cake base. Crushing them is also excellent for sorting out any anger management issues!